Blunt admissions from Sam Allardyce, both in terms of old fears creeping back and Wayne Rooney's place in his struggling team. Everton had drawn with West Bromwich Albion at home and the visitors remain 19th in the table. By the buoyancy and organisation in the sides, you would have thought Everton were in the relegation zone, though and that West Brom were enjoying a decent season. Everton are ninth but if February is like January and clubs below them pick up, their position will become precarious. Allardyce was asked whether he was worried about Everton slipping towards the trap door. It is worth remembering that this is not where he found them. "Yes, very, especially after performing like that and last week's second-half performance (against Spurs) when they went 2-0 down," Allardyce said. "I've seen a huge drain of confidence in the players in the space of one and a half football matches. The quality of the Tottenham side, I could accept that, but West Brom are in the bottom three. "If anyone should be suffering from nerves it should be them rather than us. I didn't think that was the case today, I thought we were very tentative in our actions, we were very slow to respond to situations. "We didn't pass very well and when we did it was negative, slow, unable to break them down. And it ended up being a real struggle." It was suggested to Allardyce that maybe Everton thought they were already safe, that complacency has crept into their approach. "Well, it is a false sense of security if they think like that," Allardyce replied. "We are still ninth, and when you consider just how much breathing space it gives you just by winning games on the trot and keeping clean sheets at that time - we've only taken three points out of 18. "I know the situation. We have gone from top six to bottom four in points (collected), in two runs of six games. The first six games we were right up there and then the last six we have gone right down there to points which equate to relegation (form). It does happen to everybody apart from the top six, so it is about me putting it right and about, let's face it, much better performances than that." Allardyce confirmed that Oumar Niasse, who scored Everton's equaliser, will not be sold this month because his departure would mean a new arrival and he believes the hardest position for any signing to settle quickly is centre-forward and he already has one trying to establish himself in Cenk Tosun. What does this all mean for Rooney, then? 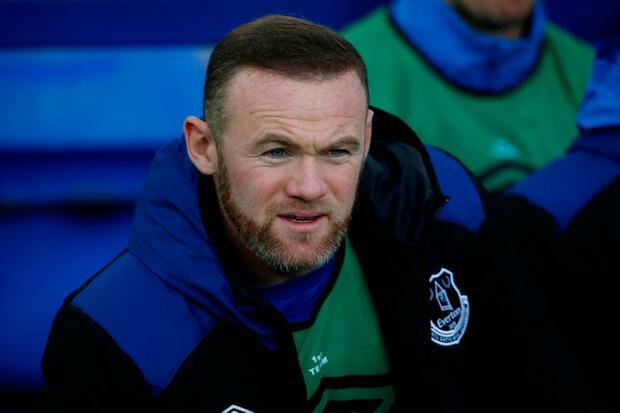 He was left on the bench by Allardyce and listening to the explanation behind the decision, it is clear that Rooney has moved from being a Manchester United substitute to not being an automatic starter with Everton in less than a year. In Rooney's way is Gylfi Sigurdsson, an attacking midfielder finding it difficult to justify his tag as the most expensive signing in Merseyside football history. "Last week (against Tottenham) I said that we have not got a lot of legs in the team and too many of the players for me... we need to be quicker," Allardyce reasoned when asked about Rooney's standing. "We have increased that with Theo (Walcott) and with Yannick (Bolasie) when he gets back to full fitness. "But in midfield, with Morgan (Schneiderlin), Gylfi, James (McCarthy), all right, but you have to be able to cover the ground, and I think that Rooney and Gylfi playing together in terms of covering the ground are very shrewd and very clever and talented players, but in actual terms of covering the ground it is difficult - it's not their strength. "So I have to make a big decision on who plays this one and who plays the next one. And for me, Gylfi has been trudging away outside on the left side, so play him in the position he wants to play and see what he can do." By comparison, West Brom's form is promising but a reasonable run of positive results might end in either of their next two games, away at Liverpool in the FA Cup then a trip to Manchester City four days later. "It doesn't get much harder than that in Europe probably; Real Madrid and Barcelona, you could probably argue," assessed Alan Pardew, the West Brom manager.